In "A Human Number", a man spends his days collect-calling strangers just to hear the sounds of the outside world. In "573543", an inmate recalls his descent into addiction as his prison softball team gears up for an annual tournament against another unit. In "Leche Quemada", an inmate is released and finds freedom more complex and baffling than he expected. Dawkins' stories are funny and sad, filled with unforgettable detail - the barter system based on calligraphy-ink tattoos, handmade cards, and cigarettes; a single dandelion smuggled in from the rec yard; candy made from powdered milk, water, sugar, and hot sauce. His characters are nuanced and sympathetic, despite their obvious flaws. 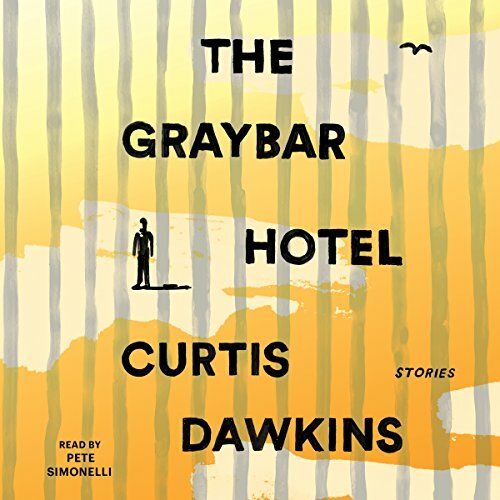 The Graybar Hotel tells moving, human stories about men enduring impossible circumstances. Dawkins takes listeners beyond the cells into characters' pasts and memories and desires, into the unusual bonds that form during incarceration and the strained relationships with family members on the outside. He's an extraordinary writer with a knack for metaphor, and this is a powerful compilation of stories that gives voice to the experience of perhaps the most overlooked members of our society.